The temperature on Capitol Hill on June 23 was in the mid-90s, and humid. Four Delaware, Ohio members of Citizens Climate Lobby (CCL), including myself, were among 800 CCL volunteers walking the Hill that day to create “Political Will for a Livable World” and to make our Ohio voices heard. Our group — Sheila Fox, Alice Frazier, Lindsey Kohlenberg and me — and other Ohio volunteers met with aides in the offices of 16 out of Ohio’s 18-member Senate and House delegation. 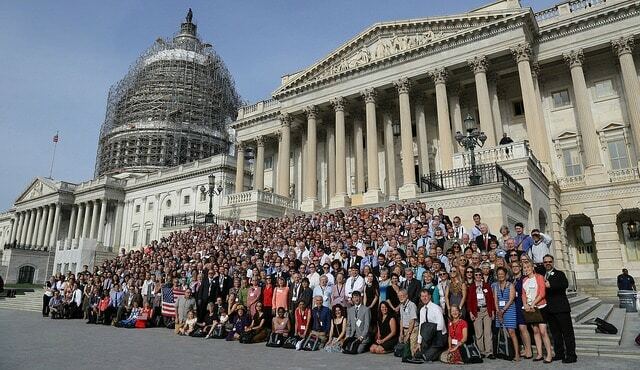 And when the dust settled, the exhausted CCL volunteers in Washington — some there from Alaska and Hawaii — had met with more than 500 congressional offices to press for climate action. So what did we talk about? We came as non-partisans, prepared with a policy that can grow the economy, add jobs, increase our competitiveness with China, and make our air and water cleaner. What is the policy? A gradually rising fee on carbon as it comes out of the mine or well-head, with all the revenue returned to households. We shared the results of a non-partisan study that found such a policy would cut CO2 emissions in half within 20 years, while adding 2.8 million jobs to the economy and saving 13,000 lives annually because of reduced air pollution. We found that the aides were actively listening to our message that the “carbon fee and dividend” would be simple, market-based and predictable for businesses’ long-range planning, and would ease the effect of higher energy prices on households. Also of appeal to Republican offices, the “CF&D” solution we described would not involve bigger government and more regulations. It would leave it up to the market to determine which technologies would win and which would lose, giving incentives to power companies to invest in cleaner sources, businesses to be more efficient, and consumers to shop around for cleaner, cheaper power and free up their monthly dividends for other purchases. Rachel’s Network Member Marianne Gabel grew up in the Rust Belt, west of Philadelphia, and after college worked as a journalist for the Philadelphia Bulletin. For years, she practiced law and worked as an advocate for children in disputed custody cases. A lifelong environmentalist, Marianne started the Delaware, Ohio chapter of Citizens Climate Lobby in 2014. Nice essay. Thanks for you constructive efforts.